Whether you're a rookie or veteran of the high-performance and racing scene, we've got something for you! Join Jim McFarland as he steps into the role of the "Performance Professor" and shares the knowledge and experience that will take you to a higher level of performance! Have a look inside today to see all the great info now available from N2Performance - The High Performance Authority! The Lecture Hall The Performance Shop Our Community! Get FREE DOWNLOADS of Performance Professor Lectures, Lecture Updates, our Lecture Archives, Future Lecture Topics, Performance Calculators, Comprehensive Glossary. Manufacturer's Midway, the bookstore... with the Professor's Recommended Reading List, great stuff from N2Performance Gear, and lots more! 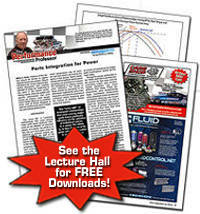 Here you'll find the Professor's Message Forum, New Readers' Articles, Readers' Rides and more. Pro Tips! More Info... Advertisers! Wells Racing Engines of Duncanville, TX has teamed with us to provide proven tips and techniques that you can use. Learn more about the team behind N2Performance and take a look at Jim's list of accomplishments and find out why he has earned Professor status. Discover why advertising your product with the Performance Professor is a good idea for your business. Downloadable media kit includes rate card. © 2002 N2Performance. All Rights Reserved. Promotion by Atomic-Hits.com. Problems with this website? Contact [email protected]n2performance.com.